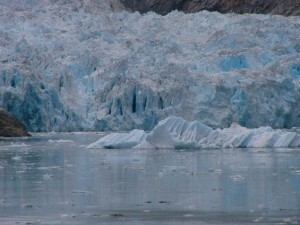 Which Alaska Glacier is the Most Memorable? 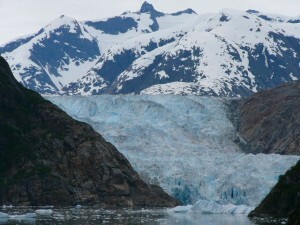 There are several glaciers that are viewable in Alaska. Some from the land, some from the water and many from the air. We recently returned from our 7th Alaska cruise. This time we went to see Sawyer Glacier. This is a spectacular glacier and sometimes hard to get to. You have to traverse Tracy Arm, which are wonderful fjords and narrow channels. But the difficulty is well worth the time. Where is Sawyer Glacier and Tracy Arm? You will find them just south of Juneau, Alaska. Only one ship at a time is allowed into this narrow body of a bay. Sometimes the bay is filled with ice and ships can’t get in. The glacier is actually in Canada. So, take binoculars in case you can’t be face to face with the ice. The day we arrived a huge chunk the size of a house had just calved. Since most of the iceberg is under water, the captain didn’t know how fast the current was carrying it down stream. You can’t tell how big these are from the top of the water. Most of the ice is below and only the ship’s instruments can tell the captain how close to get. If you want to go see this amazing place as well as Ketchikan, Juneau and Skagway, contact me and I’ll help you with a memorable trip.